Fall is totally soup weather in my mind. I love it. Hubby, however, is less of a fan. 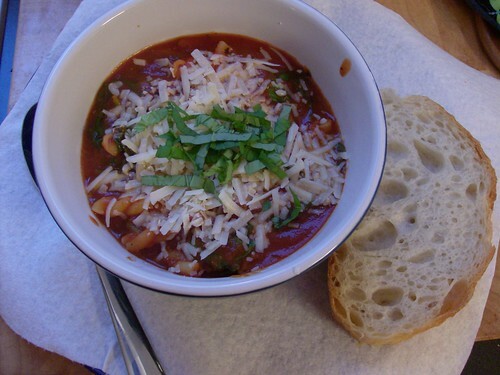 Unless, of course, it’s something like this – Lasagna Soup, originally shared by Cristi, and a permanent part of our rotation since. 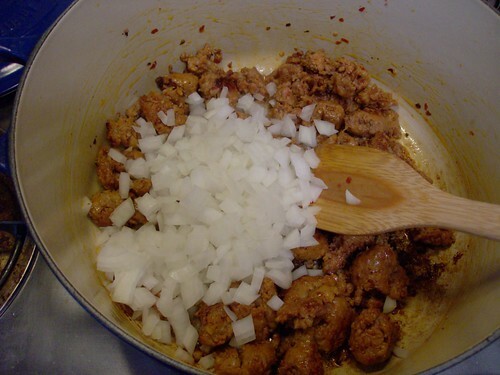 First, brown 1 pound of Italian sausage. 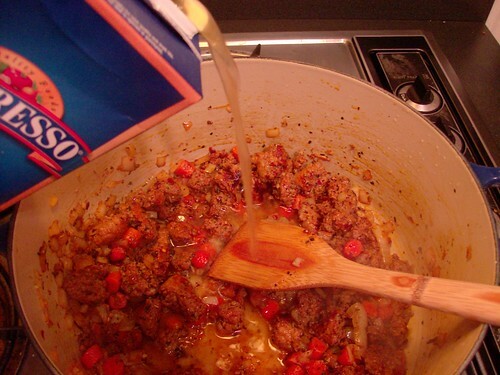 I used hot sausage tonight, but if you are less of a fan of spicy, you could mix sweet and hot, or just go with all sweet. 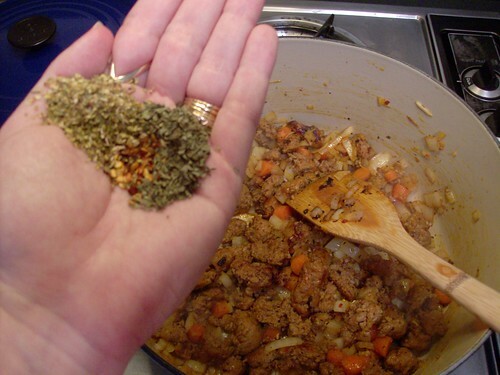 Remove it from the casings, and just break it up with a wooden spoon as it browns. And one cup of diced carrots. 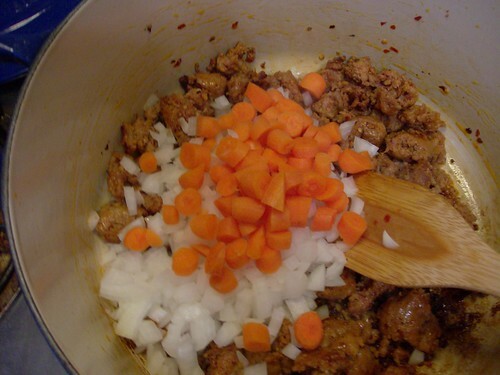 Once the onions and carrots have softened a bit, add in 1/4t crushed red pepper flakes, 1/2t dried oregano, and 1/2t dried basil. 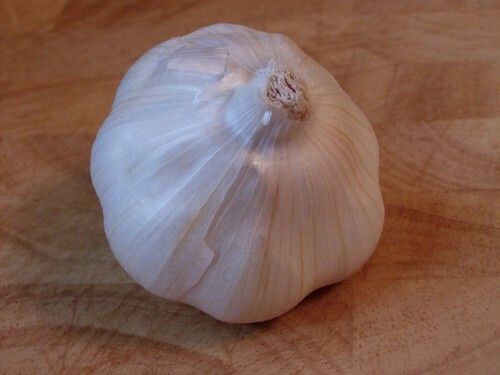 Once that comes to a boil, add in 1 cup (or more like 2 in my case) of dried pasta. The original recipe called for campanelle, but I can never find it, so I use gemelli. 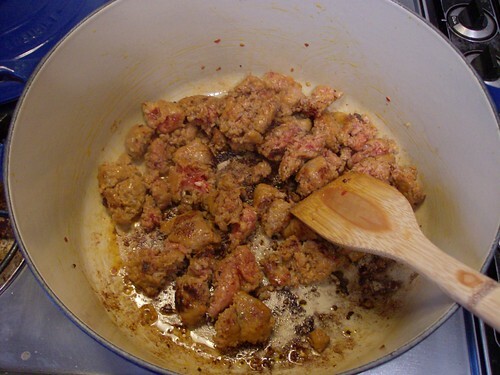 Simmer 10-12 minutes, or until the pasta is cooked. Then add in 2 cups fresh spinach. Or be like me and throw in the whole bag. What? I like spinach. 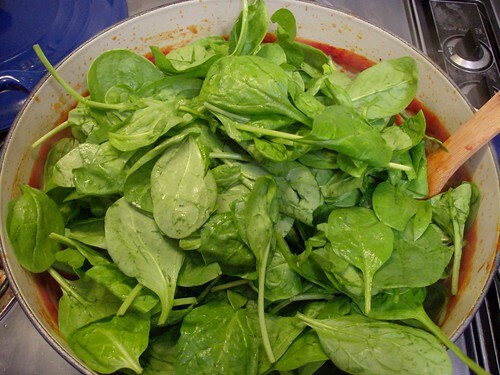 Stir in the spinach and let it simmer for one or two minutes until the spinach is wilted. Nom. 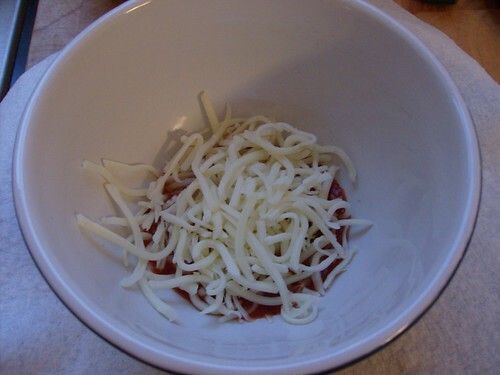 Top with a small handful of shredded provolone-mozzarella mix. Ladle on the soup, and top with shredded parmesan and fresh basil. 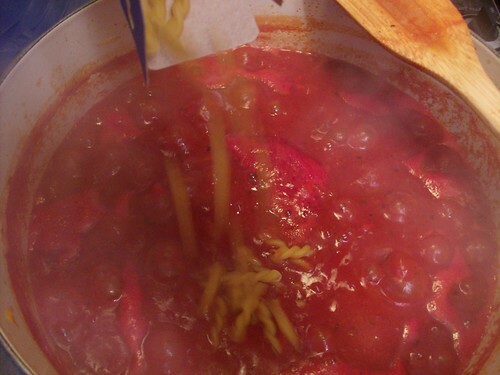 September 15th, 2009 | Tags: Food | Category: Misc. Nom, indeed. And pretty healthy too! Nice pictures. I will definitely make this sometime this fall. Great minds! I’m about to get my crock pot Italians Would Never Eat This Wedding Soup ready for tomorrow. 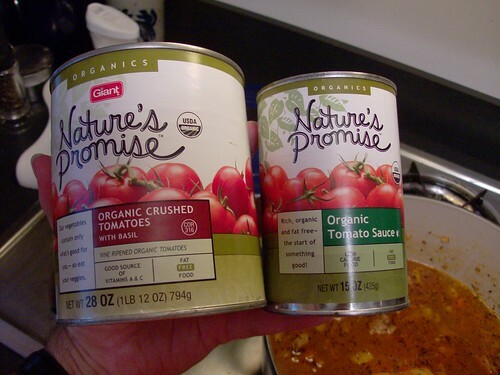 Which oddly enough if you remove the tomato sauce and cheese from yours–is the same thing! I totally need to make a giant batch of this. It’s been a while. Yum! I need to make this!! Thanks! Do you think hamburg will work? I just can’t eat sausage. That looks delicious!! Must make soon (my dad will love this!!)! 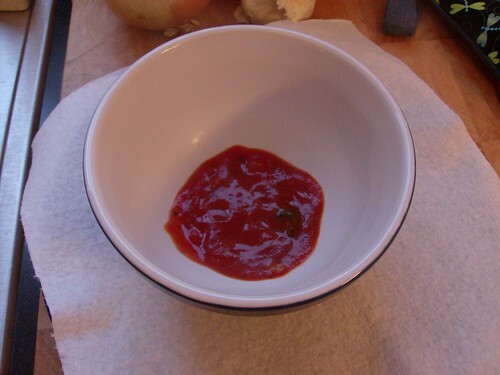 Why are you making me hungry for soup at 6 in the morning? Will definitely have to try this – I like the fact there is spinach in it. what a fantastic post! love the step by step. This almost looks good enough to make me eat meat! Hmmm … will have to ponder this one. Not sure Hubster will eat it with the spinach in there, but I’ll bet it will be good even without the spinach. I’m trying to cook more and be less lazy with the food stuff. Thanks for sharing! MMM that looks good. 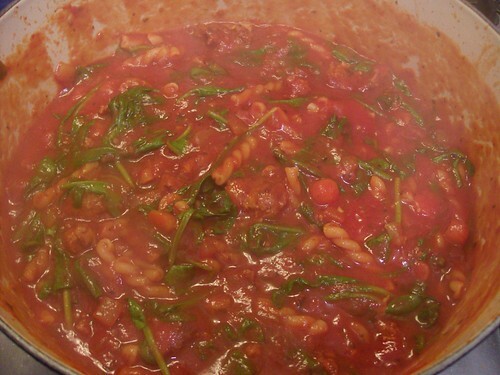 I would’ve left out all that spinach (i do love spinach but not in a soup like that). I would’ve served it with much much MUCH more mozzarella and then added a bit more just in case. And then a nice dollop of sour cream.